Lofoten Islands today: Stormy. Rainy. And has been since I arrived. And long before that! But in every other aspect it is a wonderful place to spend the last week of the year. At the time of writing I am listening to one of my SDR-IQs in Kongsfjord via Logmein remote software and a 3G Mobile connection in my end. Typically disturbed conditions which means little else than the common Prairie stations (especially from Canada) and Alaska. When nothing else is heard, they are ok to listen to and the audio quality over the mobile phone connection is surprisingly good. A few audio drop-outs from time to time though. Since I am going away this Christmas, I have been working on preparing Kongsfjord for remote control. Easier said than done. First, broadband was delayed by almost three months. It is a radio-based connection with a 5 GHz radio communicating with a base transmitter a few km away. With the radio and antenna up, I connected the PC. Nothing happened. No connection. After a series of trial and errors, it turned out that the equipment was faulty. New radio, new antenna. Connected to the PC by wire; the speed was as advertised, 2000/500 kbps. Tried to put up a wireless router. No connection. Being rather inexperienced with configuring routers (all previous routers I've had were plug and play), I spent quite a few hours trying to set things right. This afternoon, a day and a half from going away, I got it working. At the time of writing I am remote controlling my Scaleo PC where two SDR-IQs and one Perseus are demodulating with no problems. A "pro" licence from Logmein has enabled me to have audio from the Scaleo to whatever PC I choose to work from. So, unless we have a power-down or the broadband goes down I should be able to listen to Kongsfjord from my Christmas location in the Lofoten islands. The Scaleo has 3 GB RAM and a 6400 AMD processor; CPU usage is typically 75-85% with peaks around 90% when all three SDRs are demodulating. KRCN has had a very good signal this fall, even dominating over Calgary at times. This evening Brooke Nelson, Producer, confirmed my October 16 reception with a most friendly email. Turns out Brooke had done an extensive net research on my area and found out to his amazement (and horror?) that fried cod tongues is a favourite dish here. That's correct; we cut their tongues out, dry the rest of the cod and send it off to Italy as stockfish! I've heard CHGM only once with a proper signal (and an ID to match), in October 2006. And I may not hear them again since they will leave AM in not too long. Anyway, a few reports were sent out but with little luck until yesterday when Francis Rémillard confirmed my reception. I am glad I have made a habit of checking Gmail's spam folder because that is where his reply went. On to a totally different subject; the Eton E1xm advertised below has found a new home and a worthy owner. This time I succeeded. But again, the switching PSU of the Perseus created problems. When connected to the same 4-way AC outlet as the signal generator, the PSU created noise that the signal generator picked up and distributed back to the Perseus so I actually needed signals of -80 to -90 dBm to get a 10dB SNR! Another reason to replace it with a stabilised PSU. When I placed them at different AC outlets, noise was gone. Funny that the Perseus itself appears to be immune to the noise. But I got my measurements, didn't I? Indeed I did and they show a uniform -102 to -103 dBm sensitivity in AM, 6 kHz bw, 30% modulation with AGC off. Preselector, Preamp and Dither were all on. When I switched Preselector off, sensitivity increased a couple of dB, typically -103 to -105 dBm. While the Perseus (or the SDR-IQs) doesn't match my Icoms which have levels around -111 to -113 dBm, it should cope well even when DX-ing at very low signal levels once a high-quality preamplifier has been set in front of it. I tried to remove the Loran C notch filter to see how the Perseus coped with it. Same result as with the IQs: Severe overloading on MW. But I hadn't expected otherwise. Anyone Looking For An Eton E1XM? With three SDRs in my radio room (2 x SDR-IQ + 1 Perseus), I just need to cut down on the number of conventional receivers. I sold my Icom IC-7000 a few months ago, and I have decided to sell my E1. That would leave me with 2 x IC-746Pro and one IC-703, all three specially modified for MW DX by Dallas Lankford. It is not likely that any of them will ever go. My E1 is of the "refurbished" stock - Eton did a recall because of a missing trace in the circuit which could cause battery heat-up if the user was using both an AC adapter and batteries. The issue was dealt with by Drake according to web sources. I bought it from a US dealer who filed for bankruptcy the following day. Hopefully there is no connection there... I believe there is a tag or sticker inside confirming that it has been repaired. The E1 is a very fine receiver indeed and very sensitive (0.5uV in AM, 7 kHz, 30% mod) and with very good selectivity and the possibility of using AM Synchronous Detection with the Lower, Upper or both sidebands. My E1 has been exceptionally well kept even if it has many hours in the "On"-position. There has never been a battery in it. Original box. I was thinking EUR 300 or equivalent + shipping. The price would probably exclude North Americans because of the poor USD-EUR exchange rate, but the E1 is much higher priced in Europe so this should be a bargain for most European DX-ers! I'll throw in the correct AM antenna connector. Electronic bank transfer to my IBAN is the only option for payment. For another EUR 50 I'll throw in an iriver flash-based MP3 recorder/player with a dedicated line-in (very few have these days). These are excellent recorders with a recording level adjustment, and using 64 kbps gives you 32 hours of DX which can be dragged and dropped to your PC's hard drive (full UMS compliance). Powered by one AA-battery. 1 GB. I've tried numerous times over the years to obtain a verification from CHIN, alas with no luck. On October 13 my SDR-IQ recorded several hours from MW, and when playing back I noted that CHIN was running "Caribbean Connection" with Jai Ojah-Maharaj with excellent strengths at times. The program was very enjoyable indeed, and I emailed Ojah-Maharaj attaching a good quality MP3 file. A most friendly reply came last night. Another interesting facet of using SDRs like the IQ, SDR-14, Perseus etc: The spectrum you record can not only be DX-ed, but actually enjoyed, during playback. You never have time to do that in a DX session. I heard KCCS on October 26, 2006 with a fair to weak signal in the CJRB mess, the first and so far only occasion I've heard them. Cindy Smith at the JC Media Group confirmed my report this evening. KCCS is now KPJC but remains a religious station. Anonymous made a comment to my previous post: "These are the first measured of sensitivity or comparasions with other SDR RX with AM signal in the world on Perseus?" Who knows. Very few people find it interesting or worthwhile to measure a radio's sensitivity. But then very few people own a signal generator which is what you need to do the job. Neither RF Space (SDR-IQ) nor Microtelecom (Perseus) have officially available AM sensitivity data. Instead they have MDS numbers for CW and SSB. The Perseus claims an MDS of -131 dBm in CW, 500 Hz bandwidth, and -124 dBm in SSB, 2.4 kHz bandwidth. Similar data for the SDR-IQ is -127 dBm in CW, 500 Hz bandwidth (no data given for SSB). So in theory (because I think these are calculated figures, not measured), 4 dB advantage Perseus. There is no substitute for measurements though. I know of two AM sensitivity measurements on the SDR-IQ, mine and Dallas Lankford's. We both got -102 dBm or 1.8uV. Nico Palermo calculated the Perseus AM sensitivity for me to -102 dBm. A measurement will probably end up in that range, possibly 1-3 dB lower if my ears heard correctly. I believe that a correct Perseus sensitivity measurement will soon be done by Dallas Lankford. Still, numbers, be they calculated or measured, will never replace real-world experience. I have yet to compare the two SDRs enough to declare a winner, and I'm not sure I want to put one ahead of the other anyway. It is highly unlikely that I will be able to hear a station on one radio that I can't hear on the other. That said, the Perseus appears to have AM bandwidth configuration options available that will dwarf most if not all other radios. Since I didn't succeed in making sensitivity measurements, I thought I'd compare the Perseus and the SDR-IQ in an A-B test today. I connected my signal generator to a splitter, connected the two SDRs to the splitter's outputs, and set up a 1000 Hz tone with 30% modulation. Both SDRs were put in AM mode and 6 kHz bandwidth. I then gradually recuced the signal level until the tone was lost in the noise. The one that lost the tone last would be the most sensitive. The SDR-IQ won by a couple of dB. RF recording should be easier with the Perseus than with the SDR-IQ but isn't. The problem is that you have to name a file before it starts recording, so there is a dialogue box to pass just like with the SDR-IQ. Playback is also more cumbersome than with the IQ since you can't start playback in a specific point in the file. You don't know where you are until you've selected the point. And you can't jump back and forth in the file; you need to highlight a period of your own choice (except you don't know how long it is and when it starts) and play that period. It automatically loops though and that's a good thing. When playing though, the program keeps track of the time. Also I miss the option to tune via the up/down keys and left/right keys. And when you use the mouse, scrolling forward in Perseus means decreasing frequency while in the IQ it means increasing frequency. So operating the IQ and the Perseus at the same time can be a bit confusing. I also experienced a couple of crashes; one resulted in the need of a reboot before I could start the software again. Maybe it's a Vista issue. I also hoped that the AVG settings chosen at one session were saved and used again in the new session; apparently they are not. The AGC settings (there are four; Fast, Med, Slow and Off) seem well chosen, but I would have preferred to have the option of determining the values of each setting. And horisontal lines on the display with dBm values would have been great. The above might indicate that I'm not satisfied with the Perseus. That is not the case. As stated earlier, the audio quality excels, and the bandwidth option is exceptional. And some of my issues could be because I haven't explored all possibilities yet. Oh, and one last thing, and an important one: The switching PSU. It is not as quiet as I thought. It actually produced tones every 8 kHz, not in the Perseus, but in the IQ! I had it placed in a 4-way mains socket which also sent current to the splitter they were connected to. When I placed the PSU in a different socket the noise seemed to go away, or at least be greatly reduced. But I really want a stabilised PSU for my Perseus. Sent from ssb.de on Dec. 4, arrived today. Yes I agree, the picture is NOT good... but the radio is. I tested it only briefly in Kongsfjord this afternoon. Compared to the SDR-IQ it appears to have better audio recovery, especially in AM mode. Tuning takes a bit getting used to, accustomed as I am with the IQ and Spectravue. The driver and the XP software installed without problems on my Vista PC. For some reason I was unable to make a sensitivity measurement of it. Don't know what I did wrong. There is no reason to believe that it is less sensitive than the IQ. I didn't find any threshold signals where I could compare the two properly. 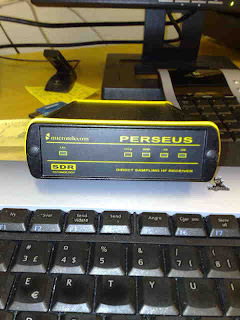 But the Perseus appears, from the 30 minutes I played with it, to be an excellent receiver. And surprisingly enough very immune to the Loran C noise I usually hear in the 550-590 kHz area. And as many have pointed out: The adjustable bandwidth control is superb. Very slick.